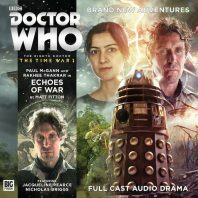 Matt Fitton’s ‘Echoes of War’ directly picks up the narrative of The Time War 1 as the Doctor and a motley group of refugees crash-land on a jungle world whose landscape is corrupted by time and jarringly cycles through phases of growth and decay. To stay alive, the party must traverse the dangerous landscape where strange creatures lurk and the brutal sounds of unending battle are ever present whilst relying on the most improbable of allies. Fitton proves adept at mining descriptive explanations for the horrendous effects of the Time War, and the planet experiencing fragmented time and causality because of temporal napalm that destroys linear time is a fascinating description of both cause and effect on an innocent world simply caught in the crossfire of more powerful beings. Sadly, it is eventually revealed that the true cause of the poisoned space-time, while surprising in its revelation and reasoning, is unsurprising in its intent as the Time Lords continue to devolve morally in order to gain the upper hand against their eternal foes. Still, as the past and present collide upon the planet’s surface, Rakhee Thakrar has the chance to develop the kind-hearted but fierce new companion, Bliss, an academic who was measuring quantum fluctuations while aboard the Theseus but now finds herself suddenly getting the most practical experience of all. This is a story that takes Bliss far outside of her normal comfort zone and she acquits herself quite well, but there is still plenty of potential for her to truly come into her own as she and the Doctor bond more deeply. ‘Echoes of War’ also manages to provide an unexpectedly satisfying Dalek tale that is unafraid of showing a more manipulative side of the Eighth Doctor that may just begin to come to the forefront more as the series progresses. Coming upon a Dalek with a corrupted memory, the Doctor is able to play upon its amnesia to ensure its cooperation as they together try to reach a temporal safe zone. This allows a brief but surprisingly contemplative and reflective discussion to arise about what it means to be a Dalek when it forgets its past, and a genuine bond and sense of respect begin to form between Dal and the other survivors as history and differences are slowly able to be put aside while crucial details remain withheld. Although this course of action brands the Doctor as a disloyal traitor in the eyes of some Time Lords, it also allows a superb discussion regarding the Time War and its combatants from the eyes of innocent bystanders who have no bias, lending yet another layer of depth to an enjoyable second instalment. Nicholas Briggs does some incredible work to give Dal a minor sense of individuality while still maintaining the base essence of a Dalek, and in many respects it truly is Dal who is the star of this story even if his given nickname is strangely close to the species name that the group is trying to keep him from remembering. While the revelation that these echoes of time are the result of future actions does leave a potentially awe-inspiring battle left unseen at this time, the depths to which Ollistra and the Time Lords have sunk is nonetheless incredibly devastating to hear. Unfortunately, the evocative dialogue employed to explain the unique temporal shifting of the environment is inserted somewhat deavy-handedly by Big Finish standards and as such the temporal aspects are not realised quite as seamlessly as in the preceding story. Still, this is a solid war story with plenty of dynamism and exciting ideas that put action and deception above a potentially intriguing prolonged study about the philosophy of being or not being a typical Dalek, and the performances of all involved ensure that it flows fluidly from beginning to end with plenty of emotion along the way.